The AquaBound Manta Ray Carbon kayak paddle is designed to provide superior performance with low swing weight by combining a carbon shaft with carbon abX blades. The AquaBound Manta Ray Carbon has a slightly larger blade surface for athletic paddlers who prefer a high angle style with more bite. It's ideal for those interested in fitness, adventure racing or those who like to use an aggressive, high-angle paddle stroke. After only using an aluminum paddle for a year, this paddle is a gift from the Gods. I don't get dripped on nearly as much because their is no recessed slot on this paddle. It's also extremely easy to just paddle with one hand to re adjust while fishing. Great paddle all around. Excellent Paddle...light weight and I did not tire as easily as my other paddle. The ability to order the correct dimension is a plus as well. Would recommend this paddle and well worth the price. Love this paddle, had one with my first kayak about 10 years ago and when I recently got back into kayaking had to have another. Light, effective. handles abuse well. The bay I mostly paddle in can be a pain on a negative tide. I use the paddle to push off a sandbar sometimes with no fear i'm going to break it. Only slight negative is the spring clips rust out quickly. Noticeably lighter than my old paddle from 20 years ago. It's amazing how much more efficient a lighter paddle is when it eliminates a lot of the energy of just supporting the paddle. More energy goes into paddling and you can paddle longer and harder. The blade is well designed and efficient. Goes in and comes out of the water cleanly. The shaft diameter is slightly smaller than my previous paddle and makes it easier to grip. This paddle is as close to perfect for me as any paddle I have ever used. I'm a high angle paddler, paddle is 240 cm. I'm 5'-11". Excellent paddle, just what I wanted. Light weight and easy to handle. I love my paddles, weight makes such a big difference. I was reluctant to spend so much but have decided it was a good thing to do. Can't say enough about ACK, selection, service and price! BUY IT! I upgraded from a Carlisle Day tripper aluminium paddle and this is amazing! it is 8 inches longer, has larger blades but is still 7 oz lighter. I can control my kayak easier, change direction and reach cruising speed faster and cruise at 2.8-3 mph effortlessly against the Texas standard 10-15 mph breeze. The texture of the carbon fiber and oval shape in the grip area make is very easy to control and hang onto. I run a Malibu X-13 am 5'11 weigh 183 lbs and usually have about 80 lbs of fishing gear. This paddle makes the whole rig a breeze to handle. Only regrets are not buying it 2 years ago! If your looking for a new paddle this one should be on the short list. very nice paddle. First, although seemingly expensive, this paddle is well worth money. Don't know that it's value could be exceeded. It's lightweight allows me to paddle for hours. My comparison is a fiberglass paddle. This carbon paddle is very light-weight yet very stiff against the wate. It surges my Cuda 12 forward with ease. My top-end speed is sustained longer. The larger paddle area and longer shaft (240mm) are also what I was looking for in a paddle. Does everything I need it to do and doesn't feel like it's going to snap on a deep pull. When I pull up with this paddle I feel like royalty. All my friends have heavy aluminum. The wide blade helps me dig in and build momentum with my big kayak (prowler big game) I say if you intend on making kayaking a hobby dont be cheap with the paddle. Only problem is I wish I had gotten the 240cm it's a bit short for my wide boat. Best paddle for the money, light and powerful! So far, Im really enjoying this paddle. I bought it to replace an old Harmony Adventurer paddle. The Harmony paddle was still better than some others that I tried, but I didnt feel like I was getting enough power out of it. In comparison, the Manta Ray has larger blades and I can definitely feel more resistance in the water. I can quickly get up to speed with a few hard strokes, but then I feel like I can maintain my cruising speed while working less than I did with my old paddle. The weight of the Manta Ray is great for this price-point too. A fine paddle. Light and sturdy, with good sized blades. A paddle after my heart! I have used it 3 times so far. Just added Yakgrips/ Velcro version to it. Hoping that these will improve the grip comfort of it, although the carbonfiber shaft by itself was not unpleasant or unconfortable and is thick enough for large hands. The plastic blades are strong and scratch resistant. Well, I guess you get what you pay for. The Manta Ray is a great paddle. It has the power to propel myself and my daughter in our large sit-on-top tandem and it provides awesome speed in my single. I was most impressed with the lack of any flutter. This is my new go-to paddle. It's so nice to get the ACK discount also. I am happy to finally upgrade to carbon. Have used Epic paddles for years and loved them. My wife needed a new paddle but since we're both retired now couldn't afford another Epic or Warner. Some Aqua Bounds had lot of negative feedback but I found this one excellent in open water/beach landings and rivers so am very satisfied. Love the paddle. Extremely lightweight. I bought this to go along with my new OK Trident Ultra. This paddle fit very well with the ride and feel of the kayak. The light weight is great for a long day of paddling. Doesn't wear you out. ACK delivered fast also. They've got my business. I finally got the chance to try out my paddle. Wow, what a difference! I always thought a paddle was a paddle. I was definitely wrong on that account. Super light weight and strong stroking at the same time. A great BTB paddle! Thanks for the recommendation ACK!!! My wife bought this for me for my birthday. All I can say it is an excellent paddle. No other paddle I tried compares to it. The wider blade makes movement a breeze. The weight is great too. I can paddle all day and not be wishing I had something ligher. My wife bought this for me for my birthday. All I can say it is an excellent paddle. No other paddle I tried compares to it. The wider blade makes movement a breeze. The weight is great too. I can paddle all day and not be wishing I had something lighter. The AquaBound Manta Ray Carbon Paddles are well designed with the spoon shape and very light weight. Arrived as ordered and tested on a long paddle, met all my expectations. Q: The AquaBound Manta Ray Carbon Kayak Paddle you sell online....is that a 2-piece or a 4-piece paddle? Is it with Posi-Lok or Snap? 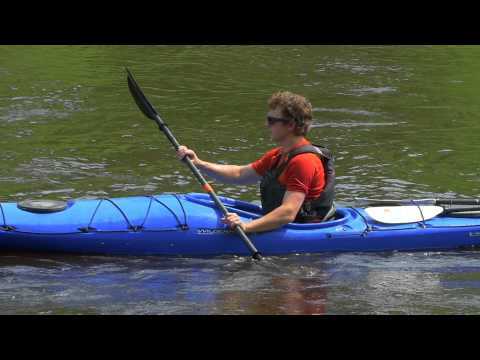 I am looking for the AquaBound Manta Ray Carbon Kayak Paddle in a 2-piece Snap. I have heard that the Posi-Lok system has it's problems.